Exterior view of the Hegeman. Copyright COOKFOX. Common Ground is an innovative non-profit organization whose mission is to end homelessness through a model known as supportive housing, which combines housing assistance with on-site social services. As part of a sustainable construction initiative, Terrapin led an Environmental Opportunities Charrette for a new construction project designed by COOKFOX Architects with collaboration from Copeland Goldmand, Murray Engineering, Steven Winter Associates, and YRG Consultants. The 64,469 square foot Hegeman Residence provides housing for low- income and formerly homeless individuals. The Terrapin charrette allowed members of the client and design teams, engineers, community members, and environmental performance experts to focus on occupant health, indoor environmental quality, and best practices to reduce tenants’ monthly energy bills. The charrette addressed site and massing issues, façade construction, energy and mechanical systems, water management, and indoor environmental quality. Given the project’s urban location, concepts of biophilia, specifically ways to utilize daylight, include views of green space, allow contact with natural elements, and create a sense of shelter and safety, were fundamental to the dialogue. The green roof reduces storm water runoff and insulates the building. Copyright COOKFOX. Green, open spaces are a defining feature of the project. The site includes a 3,400 square foot accessible green roof and a community garden. 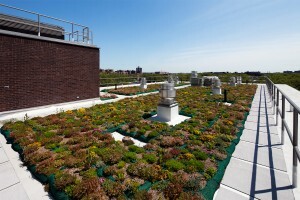 The rooftop greenery insulates the building and slows stormwater runoff from the site. In addition to the roof’s restorative features, an array of solar panels that power exterior lighting also occupies the space. Replacing a former parking lot, the six-story building addresses the architectural context of the neighborhood, adding to the quality of the residential environment. In support of New York City’s PlaNYC initiative, the project hasconvenient access to mass transit and encourages a healthy, pedestrian lifestyle. Occupant health was further enhanced by choices in materials, mechanical systems, and other construction practices. Patterns of biophilic design are found not only through the restorative connections to nature but also in the residence’s sense of refuge and security. The project received a LEED NC Silver rating from the U.S. Green Building Council. The charrette was held very early in the design process, offering optimal opportunities to explore a 21st century paradigm for the design of sustainable, supportive housing. Terrapin’s continued involvement in the project helped optimize construction and energy use, promote the goals of the charrette, and support the development process through research and technical consulting. As a partner, Chris is an architect and sustainability leader focused on systemic thinking to address challenges in the built environment. Chris believes we can learn how to live on this planet if we start listening to nature again.